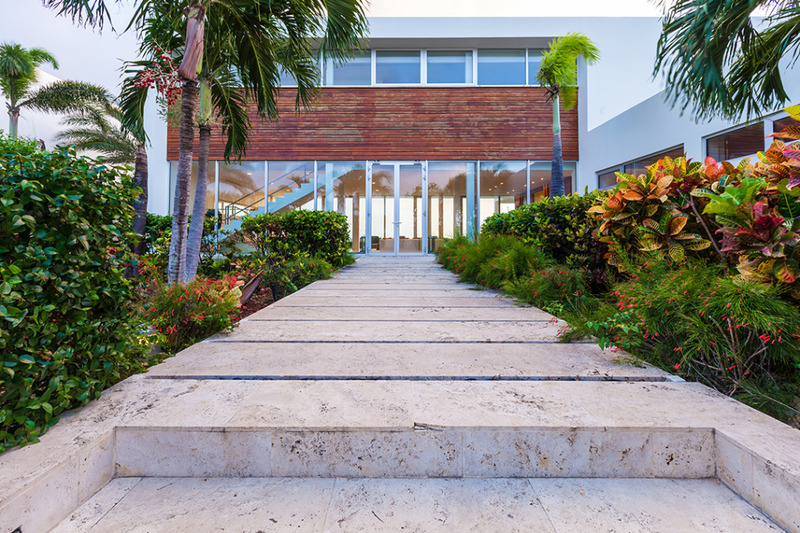 The promise of the ocean views greets you as you walk up the lush garden path to the entrance of the West Villa. 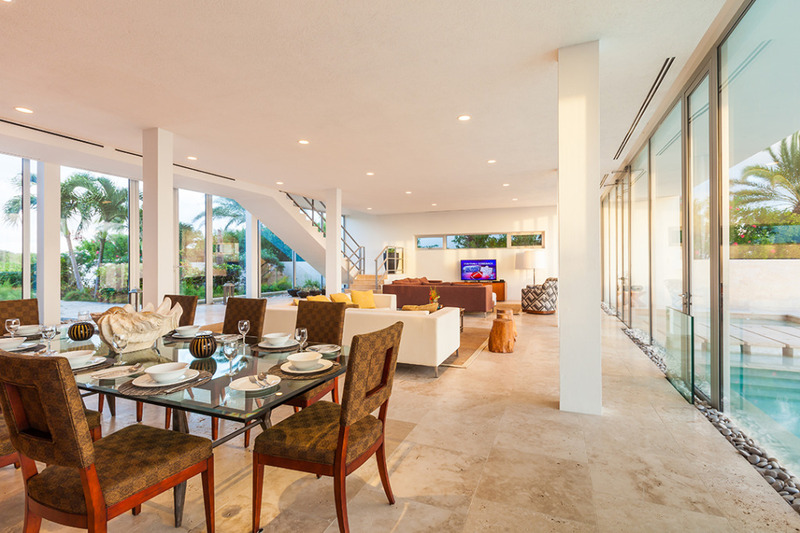 You enter into the air conditioned coolness of the spacious great room tiled in a neutral Travertine stone. 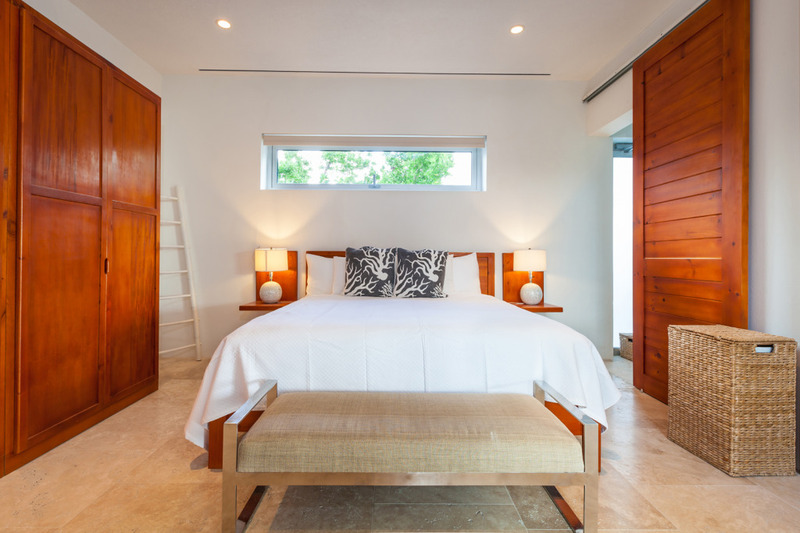 The villa is a threshold between the rocky inner island and the drama of the Caribbean Sea. 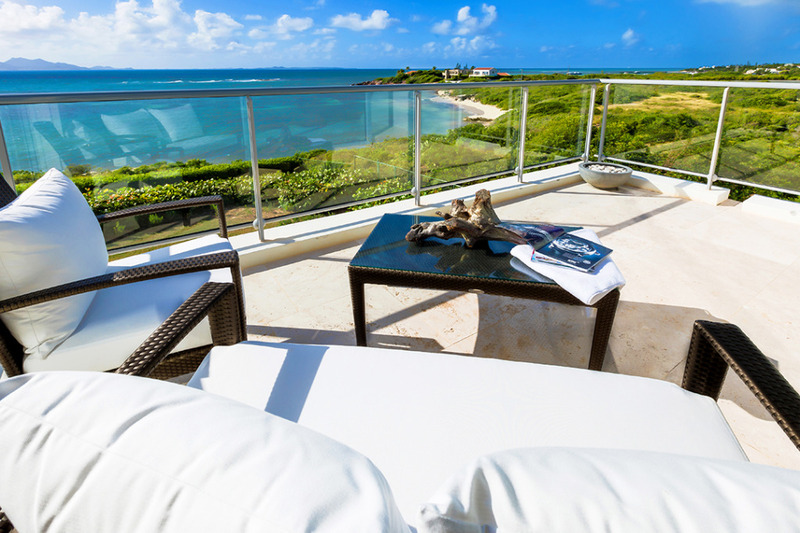 The stunning views of the Caribbean Sea and mountains of St. Martin are visible from every angle, making any seat the best seat in the house. 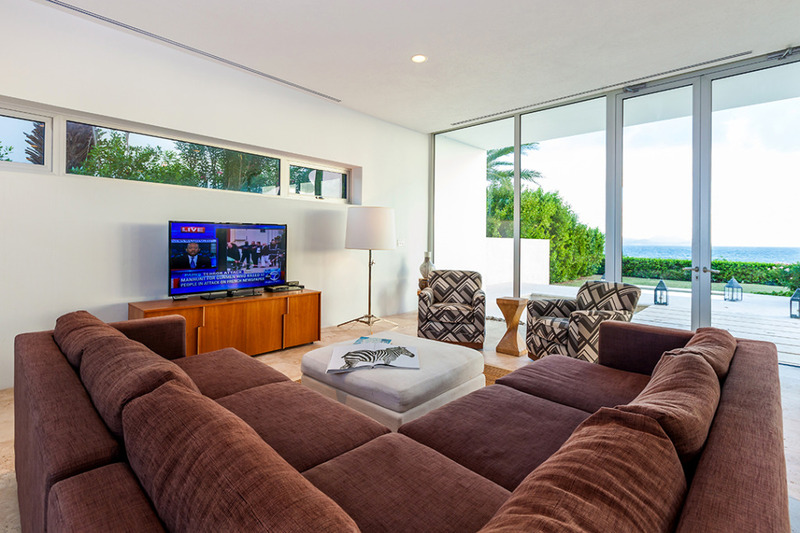 Watch the news or a movie on the 55-inch flat screen TV. Share laughs and conversation at the formal dining table. Try out a new recipe in the full-equipped European kitchen with premium appliances, or we can arrange for a private chef to cook for you! 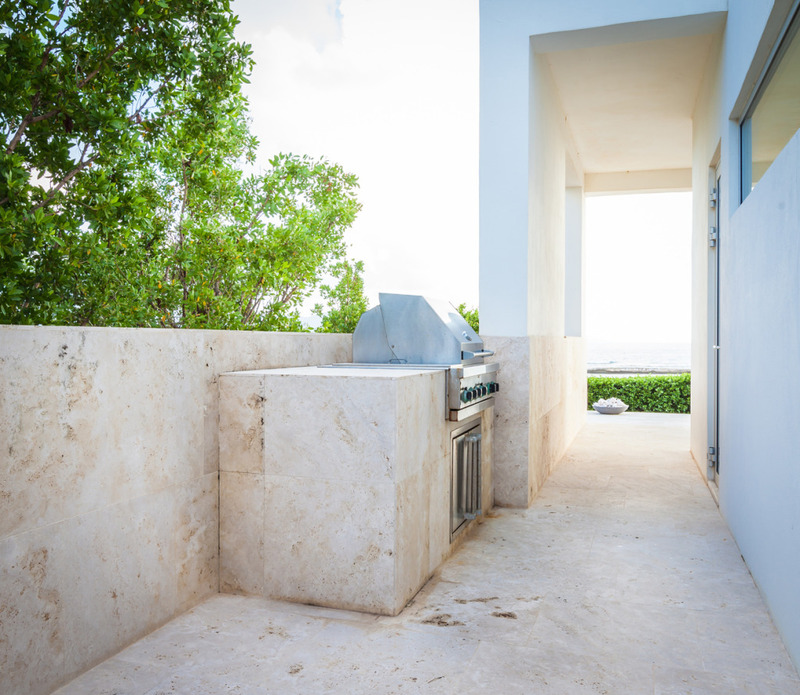 Or prepare an Anguilla BBQ on the built-in outdoor Viking gas grill. 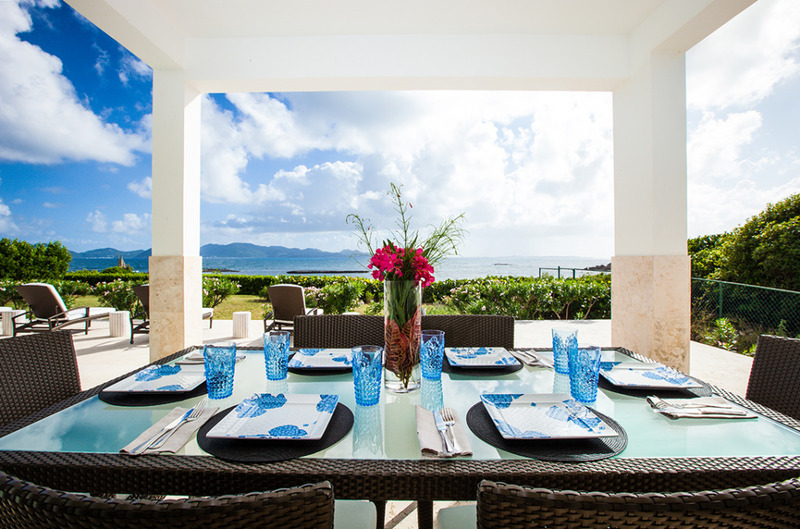 Enjoy the results outside under the shady pavilion in the refreshing Caribbean breeze. 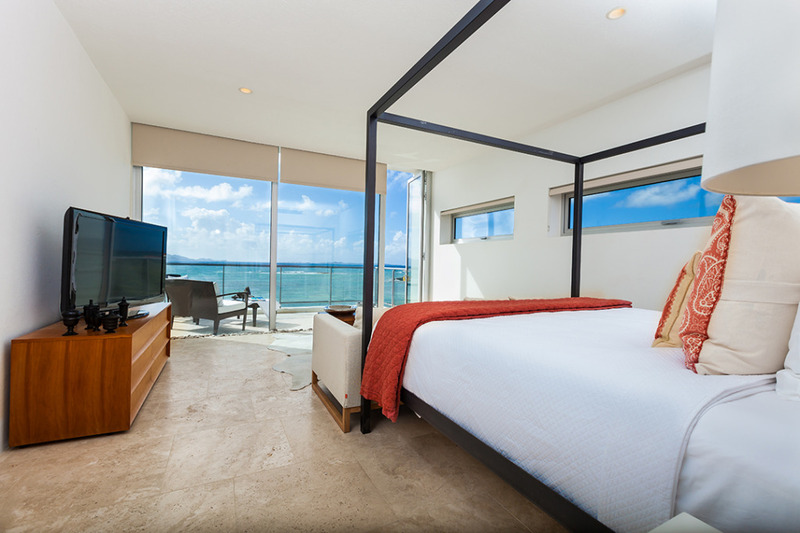 Refresh in the brand new luxury pool that extends the length of the oceanfront terrace. Or relax in the jetted Jacuzzi. 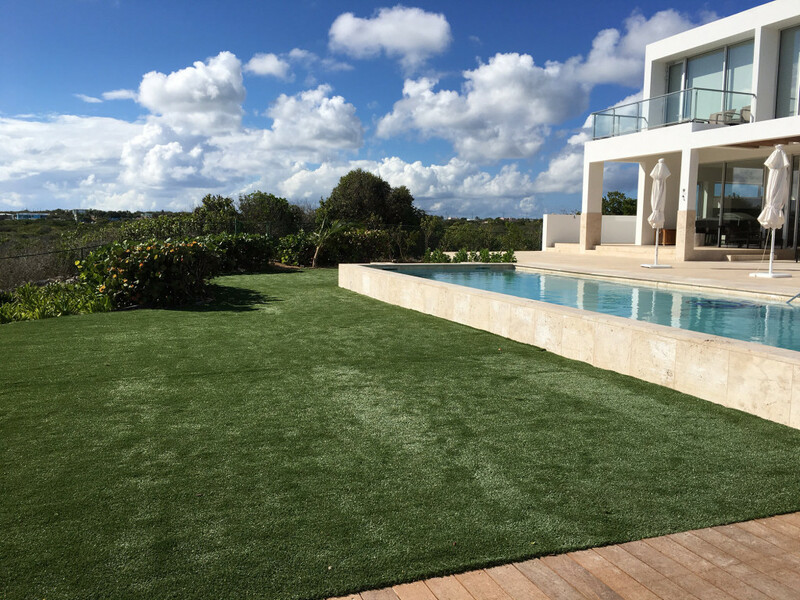 The West Villa has 5 bedrooms, all with ensuite baths. 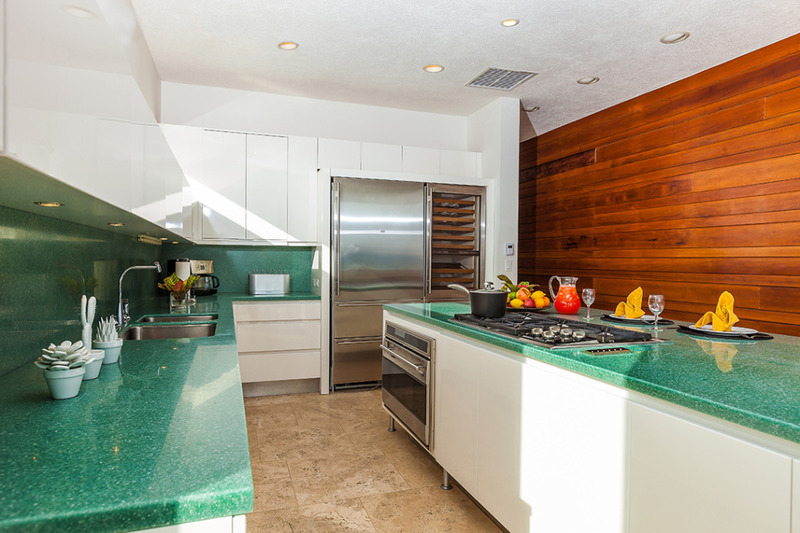 The Main Master is located upstairs and has floor-to-ceiling windows and a walkout balcony. 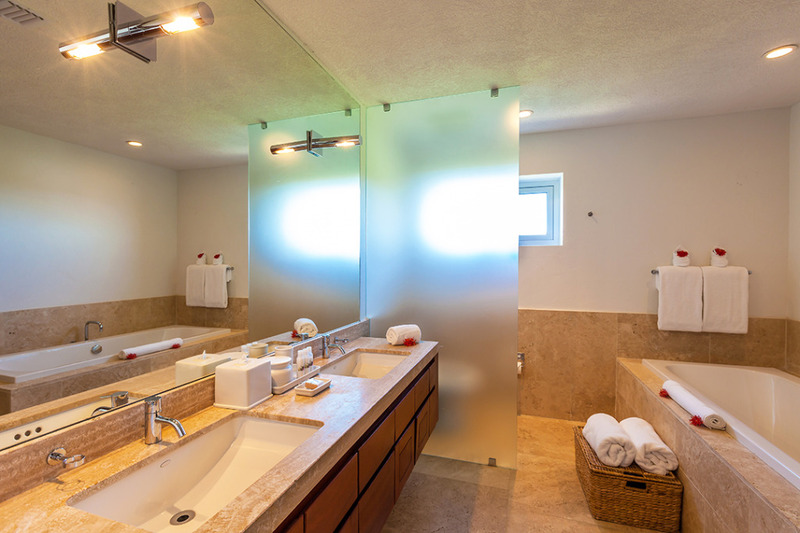 The ensuite bath has a tub, separate shower and double vanity. 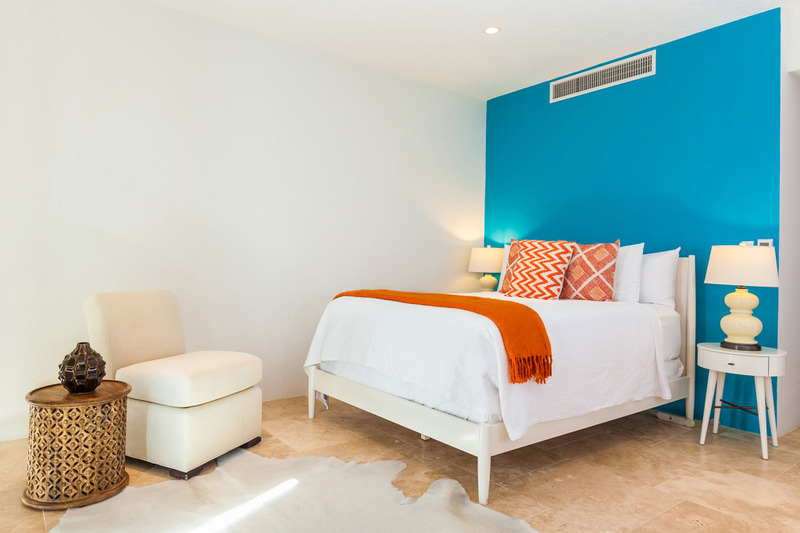 On the other end of the villa upstairs, is the West Second Master with a king bed and ensuite bath with a tub, shower and double vanity. The West Villa only also has a small Juliet balcony through the side door of this suite. 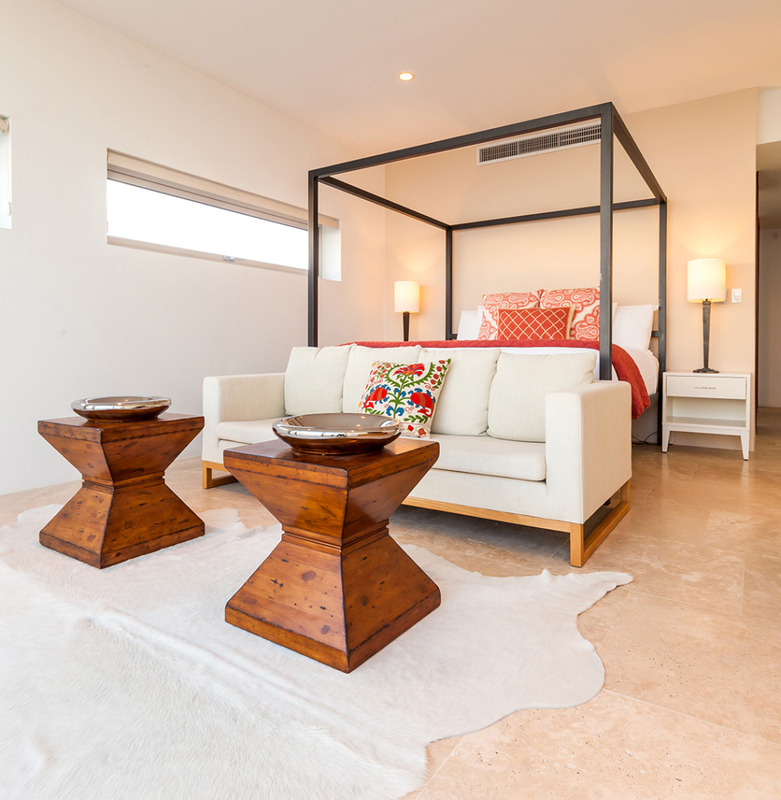 In between the two master bedrooms on the second floor are two queen bedrooms. 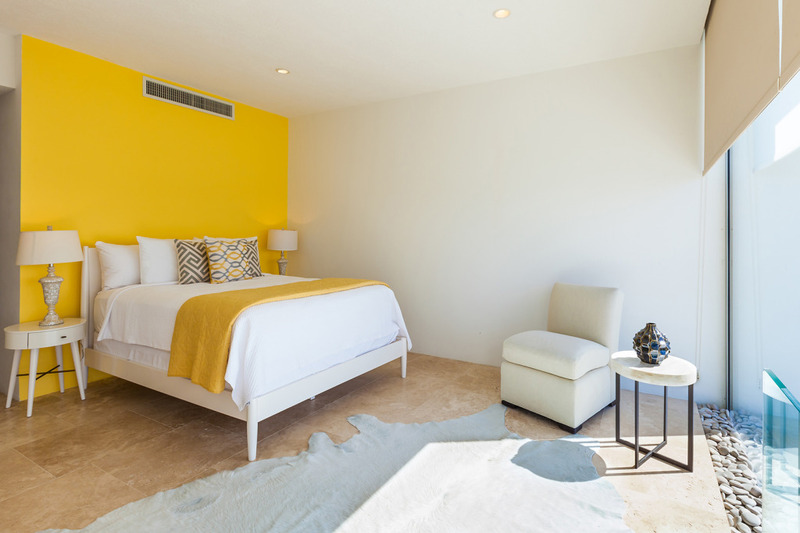 The Yellow Queen Suite has an ensuite bath with shower and double vanity. 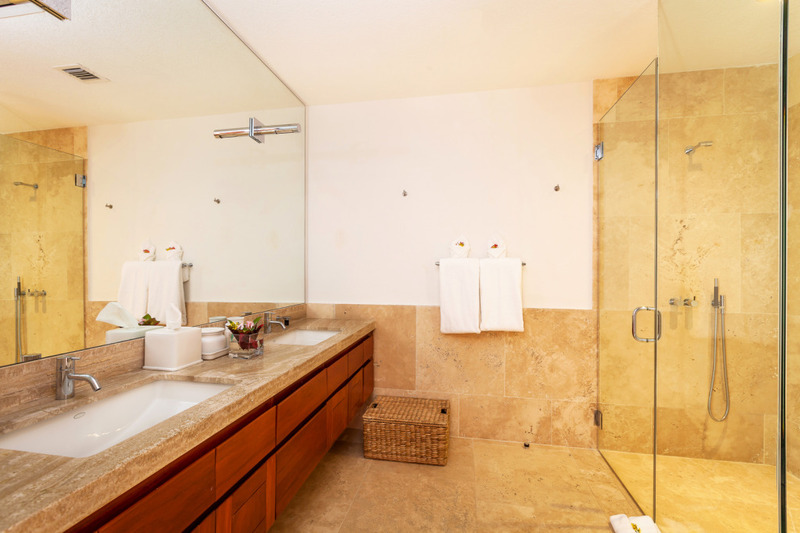 The West Blue Queen Suite also has an ensuite bath with a shower and double vanity. 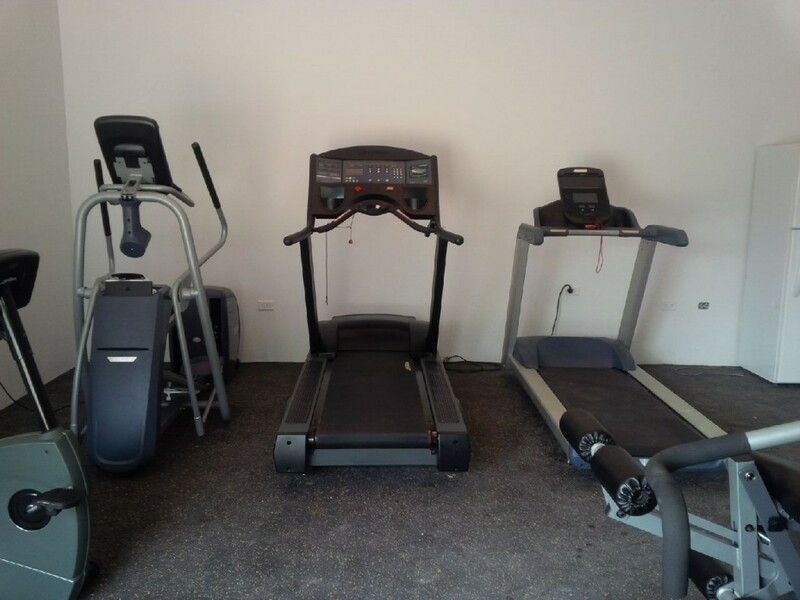 On the main level, so there’s no need to climb stairs, is the fifth bedroom, the Main Floor Garden Suite with a king bed and ensuite bath with shower. 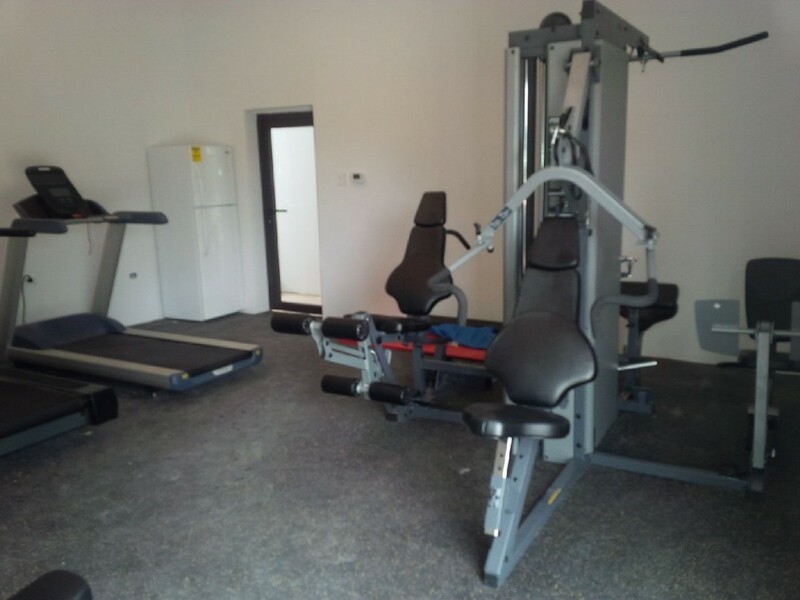 New indoor, air conditioned private gym for the West Villa. Equipped with everything you need! 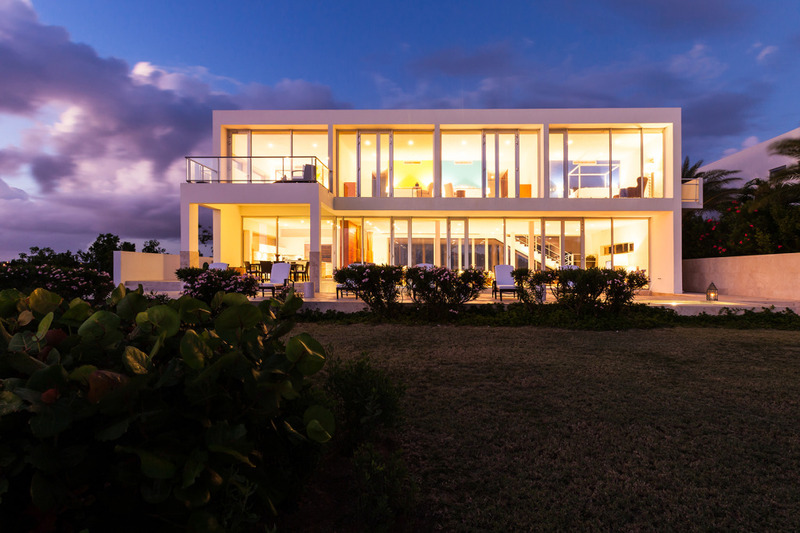 Get ready to relax and unwind in this sleek and stylish Anguilla beach house with incredible amenities and incredible views.